I’ve been weaving with fairy floss. Well I presume it must be as it floats in the updraft of the heater beside my loom. It is very cold in the back studio at Sturt and I cope with being cold by looking like “Michelin man” and having the heater under the loom. 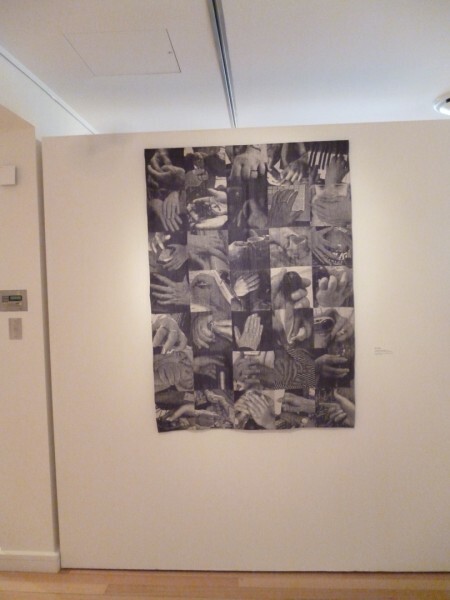 This was the final piece woven for the exhibition. The gold metallic supplementary weft is 3 threads and is very light; hence floating in the updraft. I am delighted that it made the deadline. 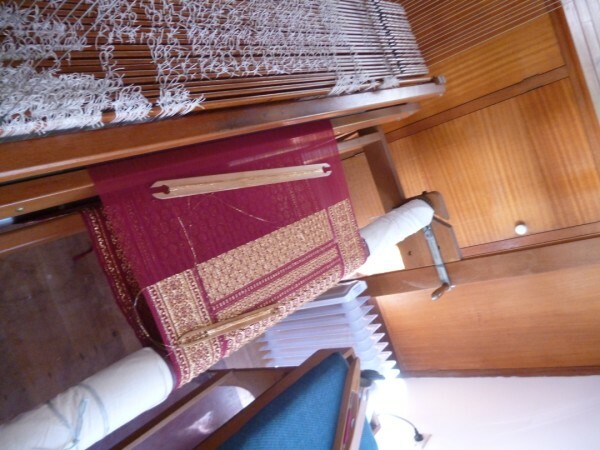 At one stage I really thought it just wouldn’t be woven in time. Work progresses in the studio. Del has finished her beautiful scarf. The gardens erupt in spring flowers. 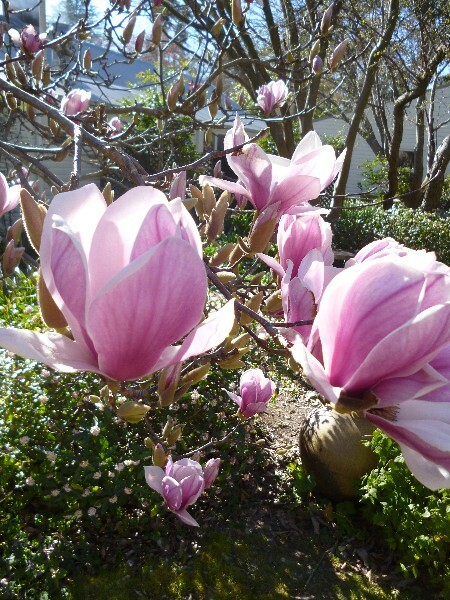 The magnolias are stunning. 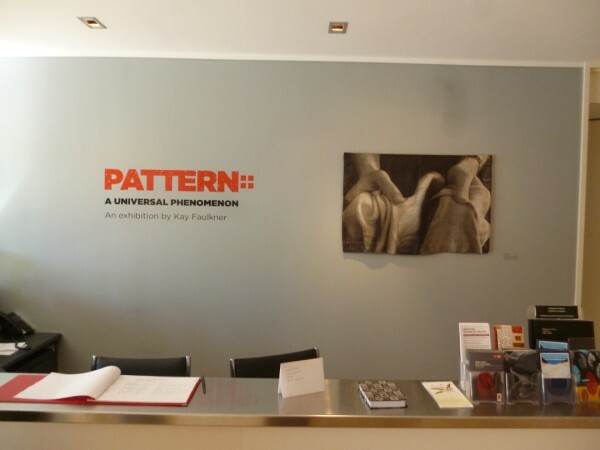 Pattern: A Universal Phenomenon is now hanging in the Redland Art Gallery. I am delighted with how it has come together. My thanks goes to the staff at RAG both for their professionalism in making this happen and to the hanging committee that have made my vision work. 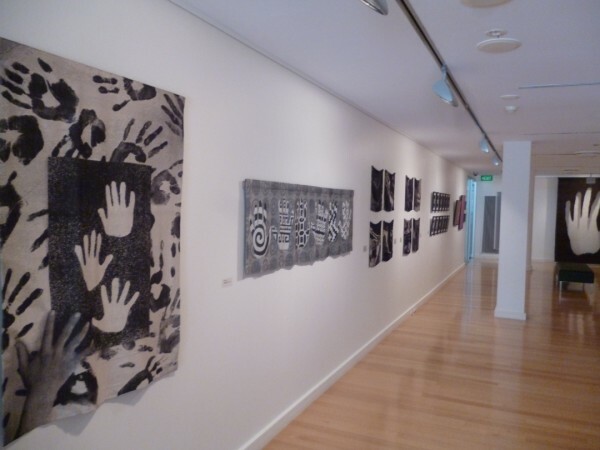 The exhibition is open till Sunday 22nd September. 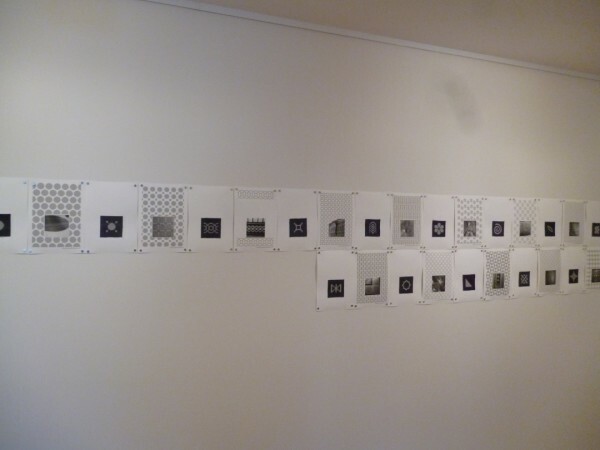 My thanks also go to all the people who came to either or both the opening and the floor talk. 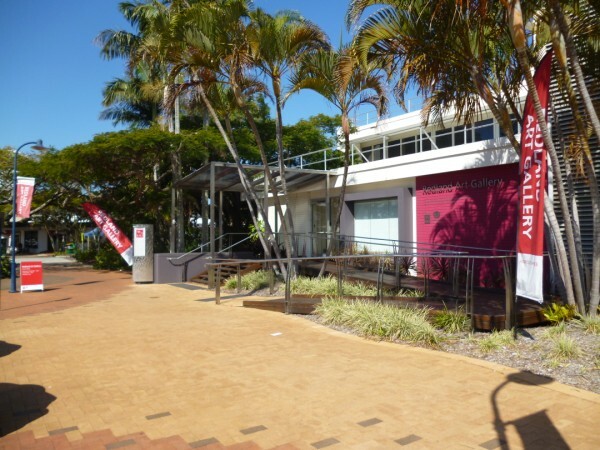 It was a grand turn out at both and I certainly appreciated the response to the exhibition. I am including some images. At some stage in the near future I will put the full picture on my website. The front desk.The following images are as the work appears from the left hand side of the gallery working around the walls to the front again. 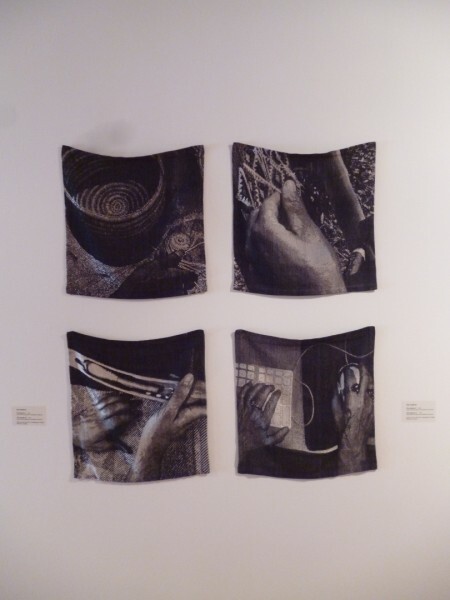 The Woodworker’s Rag, The Painter’s Canvas, The Potter’s Apron, The Weaver’s Cloth. 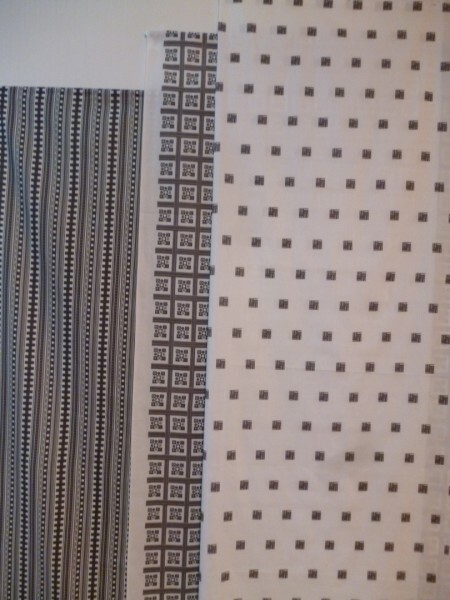 Fabric lengths using motif from the Take Five series. Journey by Hand. 25 damask pices mounted with matching design source and repeat motif. This series couldn’t have come about to its full potential without the graphics wizardry of my friend Indra Deigan. Section of wall show The New Mexico series, The New Zealand series, The India series. Section of wall showing The Italian series and The West Timor series. Timeless and printed fabric lenghts. One has been overdyed. Section of wall with Meeting Place. 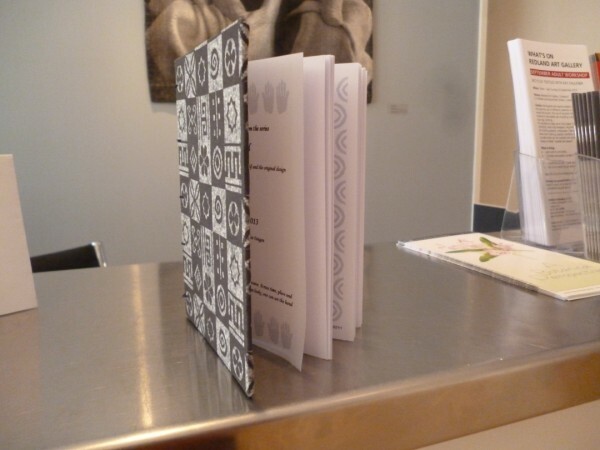 For this exhibition, I have also produced a limited run of journals. The journals have images from Journeys by Hand. One day not so long ago I spent the afternoon with my friend Judith Krone at her cabin (see June post)learning how to do coptic binding. Little did I know it would result in this. 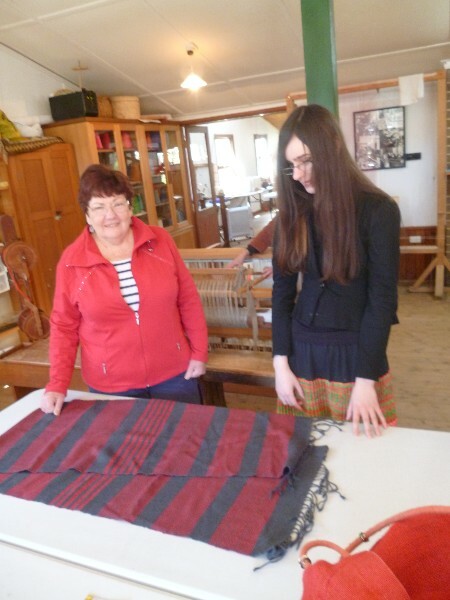 Judith also introduced me to Spoonflower where I have had the fabrics printed. 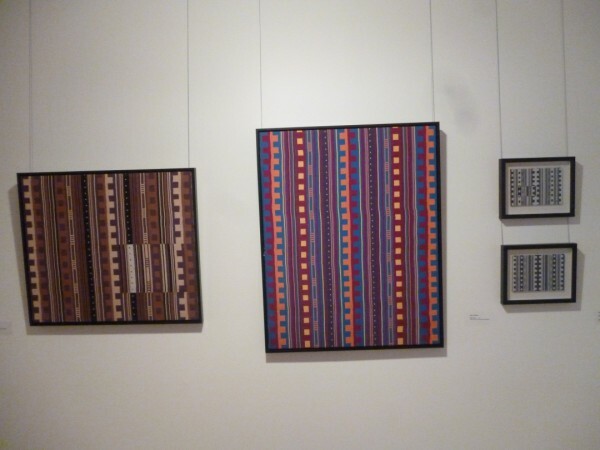 I would also like to acknowledge the Centre for Contemporary Textiles in Montreal. 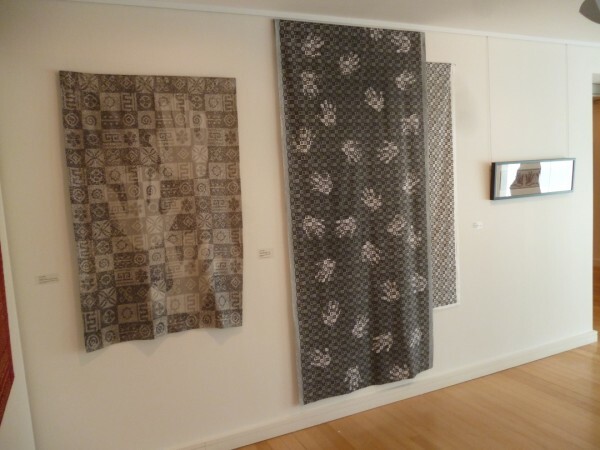 It was there I spent time and had these jacquard textiles in this exhibition woven. 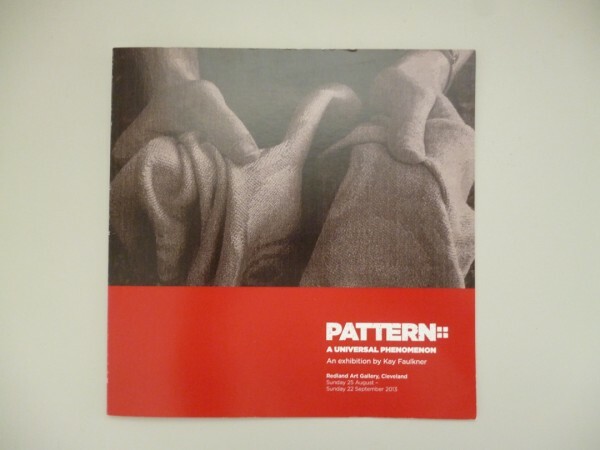 Finally, here is an image of the front of the catalogue. 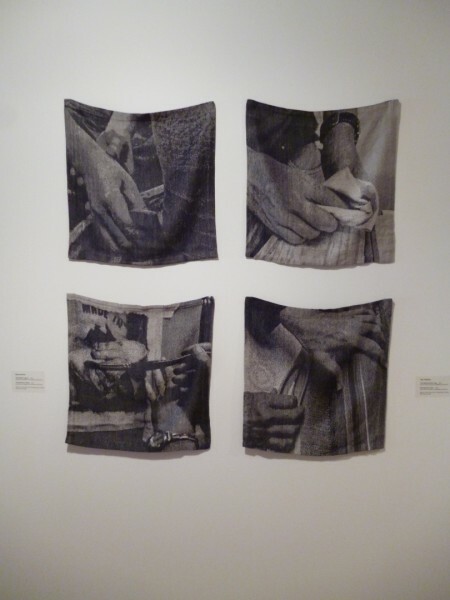 RAG produced it with words from my friend, Myann Burrows who had seen the work develop and understood. This month’s focus is on design inspired by my adventures in India in 2008. 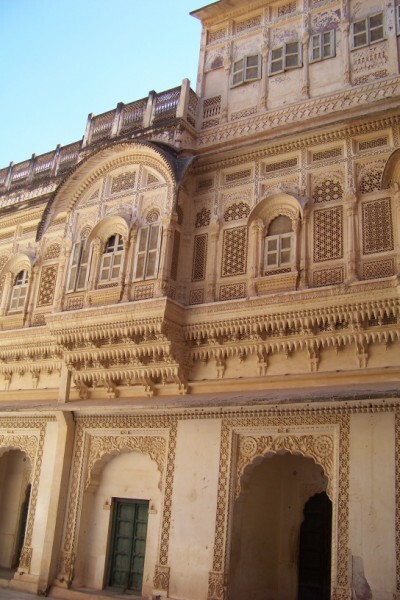 Our adventures were based in Gujarat and Rajasthan. I have very vivid memories of bright colours that zing and yet also being amazed at the white costumes of daily life and the notion of keeping them white. 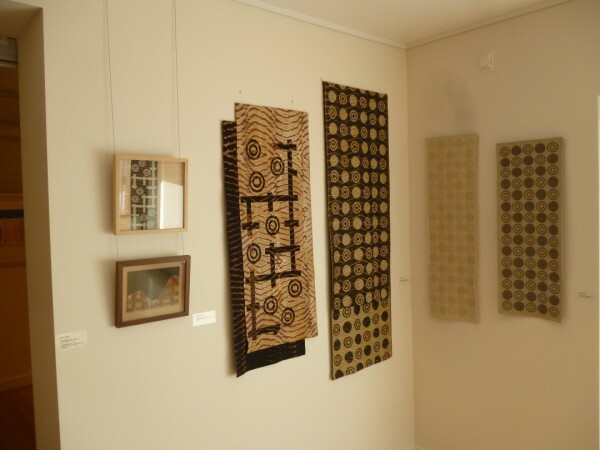 Memories of textiles in a multitude of techniques: bandani (shibori), ikat, wood block printing, embroidery, mirror work, natural dyeing including indigo, simple and complex weaving patterns. Then there is the echo of over ornamentation that crosses over into decoration on houses and public places. India is rich, diverse visually and an overwhelming feast for the senses. 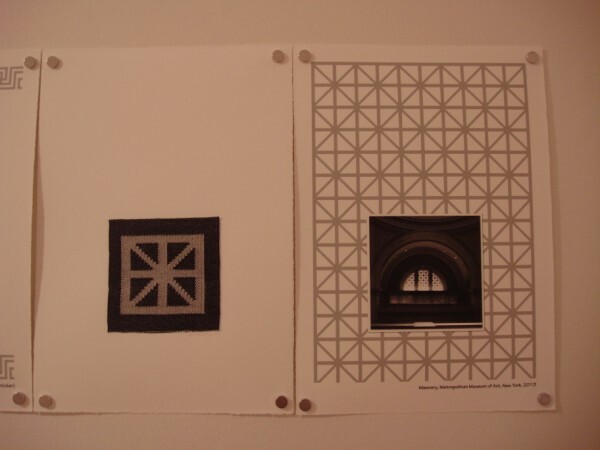 As a starting point, I decided that I needed to select 2 motifs: a very difficult task. 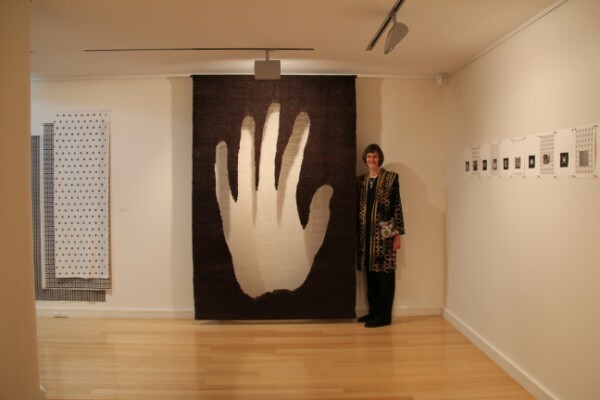 The criteria were that they had to have some significance for me and that the primary source was not textile. I did have a lovely time looking back through images and remembering. 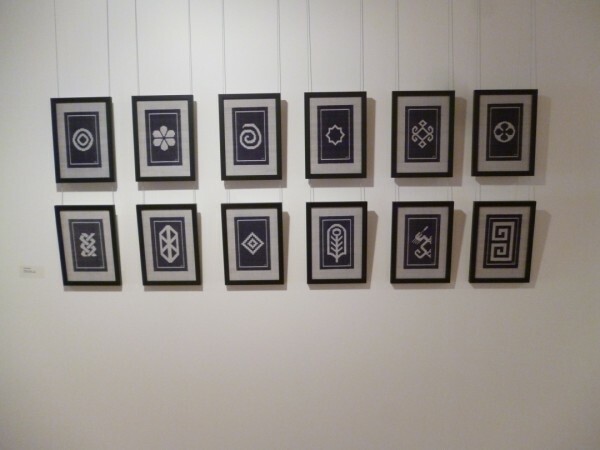 These motifs would then be converted into woven designs. 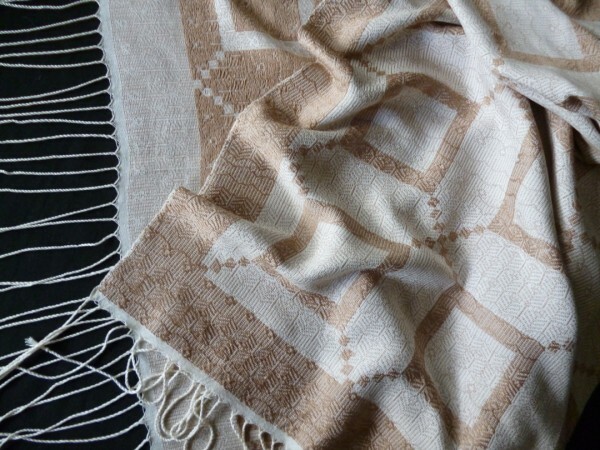 My intention is not to reproduce Indian textiles but rather use them as inspiration. I spent a lovely day with a friend who was living there and with some of his Indian friends. 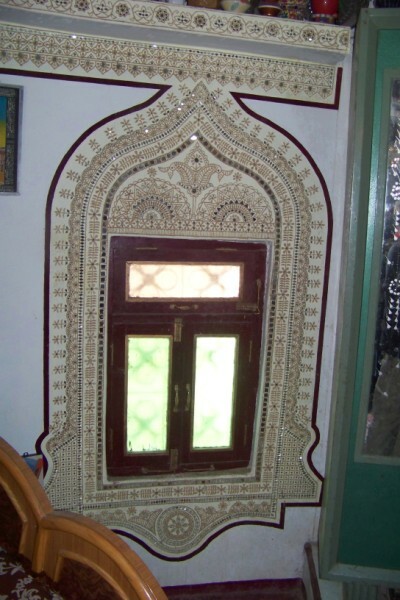 I visited their home and saw marble screens with decorative carving to let in the light and keep out the heat. We saw a number of exquisite and very diversely patterned screens in various castles where they were used to separate the women’s quarters so that the women could look out but no man look in. A whole subculture existed there. The concept of looking through and community appealed. I have chosen a screen pattern and squared it to suit my purposes. 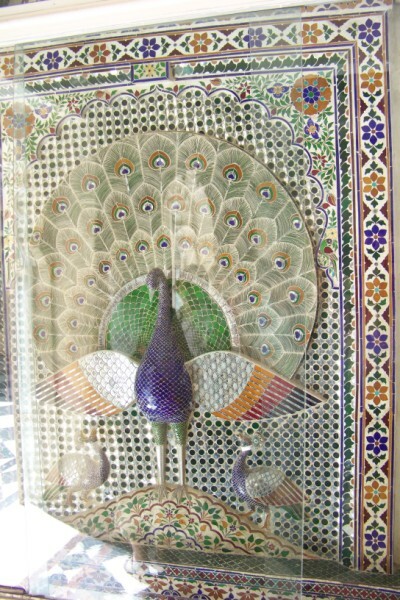 A common image used in various forms relates to the peacock. This sacred bird was declared the national bird of India in 1963. 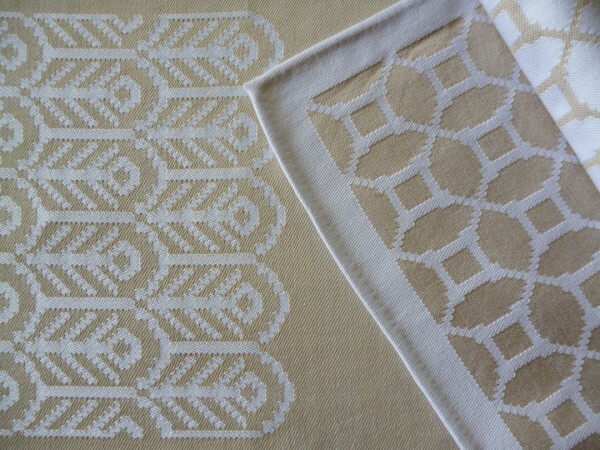 It has a very long history of design motif usage both in architecture and textiles. The shape of its tail is used extensively to frame windows and entrances. I came across this glorious example in a wonderful palace courtyard in Udaipur. The fact that feathers are universally used in design was also of influence in selection. 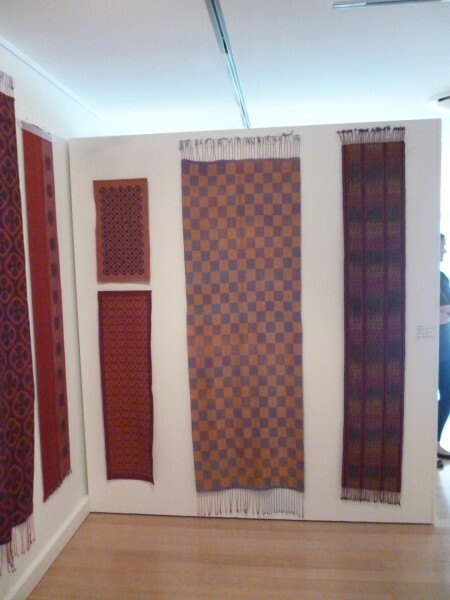 The following are some of the pieces I have woven using both motifs. In spite of the fact that India does equal colour, I chose to acknowledge the imapct that white had for me. This colourway is also very reminescent of the interior of the mud house. 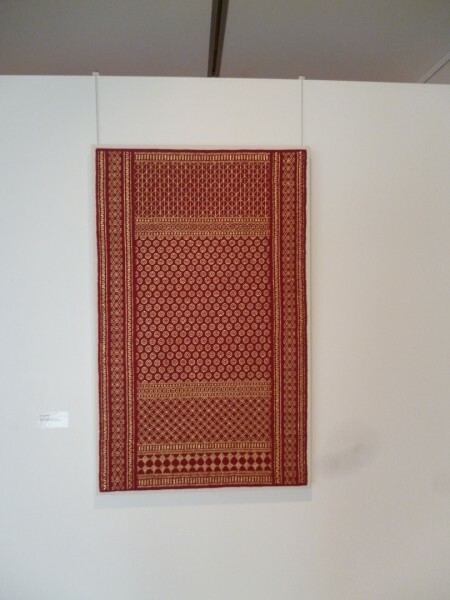 This silk wrap combines both motif in the design. But, India does mean colour. 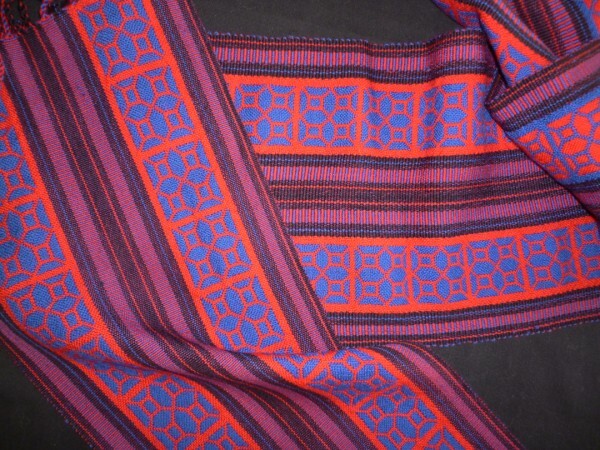 Saturated colour has been used in this double weave scarf using the screen motif. 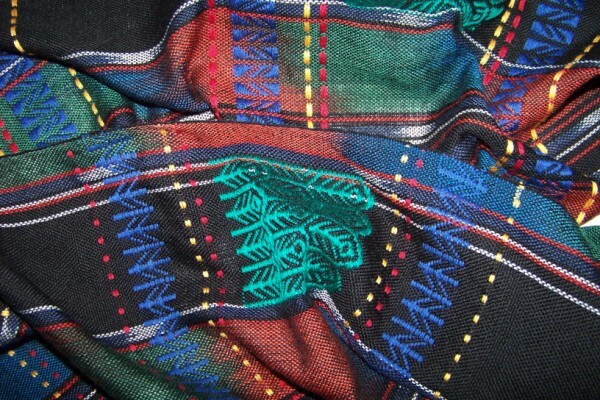 This scarf combines several techniques acknowledging the diversity of Indian textiles. Variations of the feather motif have been used. 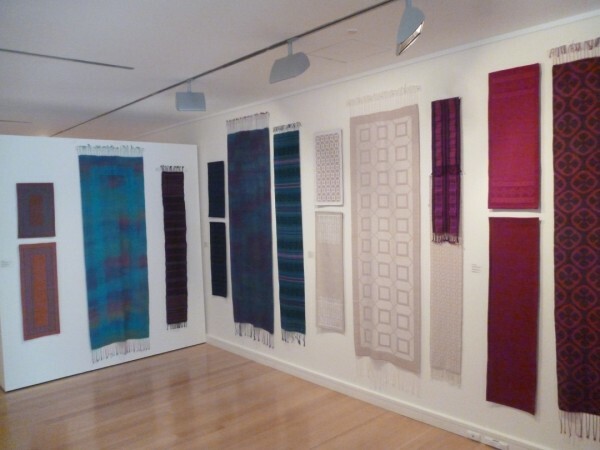 You are currently browsing the archives for the Textiles inspired by India category.